In the year 2000, my wife to be Cindy and I went down to Florida with my parents so that Cindy could meet my Grandparents. While we were down there, we arranged to spend two days on July 3rd and 4th and go over to Walt Disney World. We had a great time, and Disney magic was evident in full force for those two days. You see, despite it being the 4th of July holiday, the parks weren’t that crowded, and it was also Cindy’s first visit to Disney. On August 11th, Cindy and I were married; we have now celebrated ten years of marriage. That first Christmas was a very special one for many reasons; first of all, we found out that we were going to have our daughter, Sophie, so that was cause to celebrate. Secondly, it was our first Christmas, and it was very special just because it was our first. 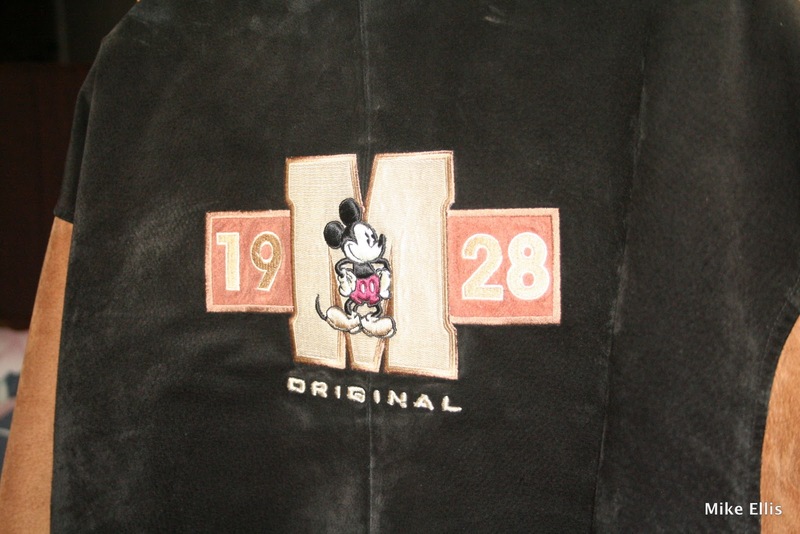 Lastly, Cindy gave me my greatest Disney treasure – my suede Mickey Mouse jacket. As you can see, this jacket is truly special. The funny thing is that we saw this jacket for sale at the Disney Store at Tyson’s Corner Mall the weekend after Thanksgiving, and I remember looking at them, and then getting side tracked to somewhere else. Little did I know that Cindy had bought the jacket when I walked away, and disguised it somehow so that I wouldn’t know about it – and I was the one that carried the bags to the car that day! To this day, it is my favorite jacket, and with fall weather hitting us and giving colder temperatures, it is a great time to wear the jacket. I have only seen one other person wearing that jacket – someone was wearing the same jacket at the Magic Kingdom the next month, when Cindy and I went to Disney World for a long weekend and ate our way through Disney. It has kind of surprised me that I haven’t seen anyone else with this jacket, but that just makes this Disney Treasure even more of a treasure for me! Do you have a special item like my jacket? Let me know in the comment section below.